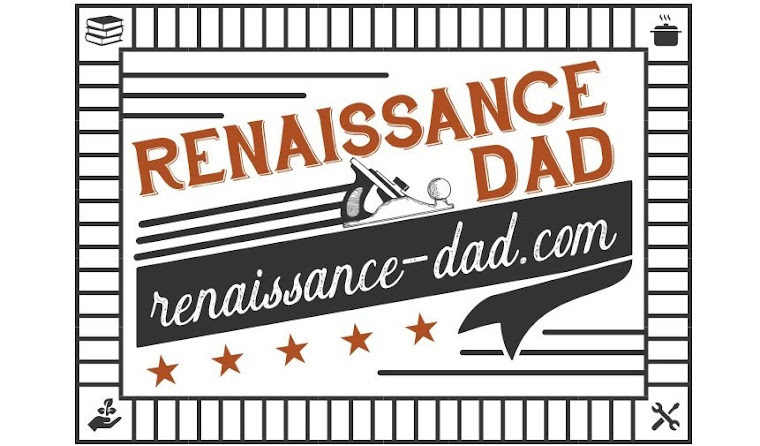 Renaissance Dad: What Can I Learn from a Sock Hop? One of my favorite memories/traditions with my daughters is our regular daddy daughter dances. As an educator, I help chaperone Prom every year, and for the past seven years I have always taken one of my daughters as my date. They love it, my students love it, and I get to dress up with one of my girls and have a fancy date. So last week, when we got an invitation for a Sock Hop at my kids' school, I was pretty excited to take them. And I was shocked when Little E said that he wanted to go. He typically likes to lay on the floor and play Legos with nobody touching any of his precious pieces. But hey, he wanted to go to a social event at his school, so we decided to make it a family affair - my wife and I and our three kids. 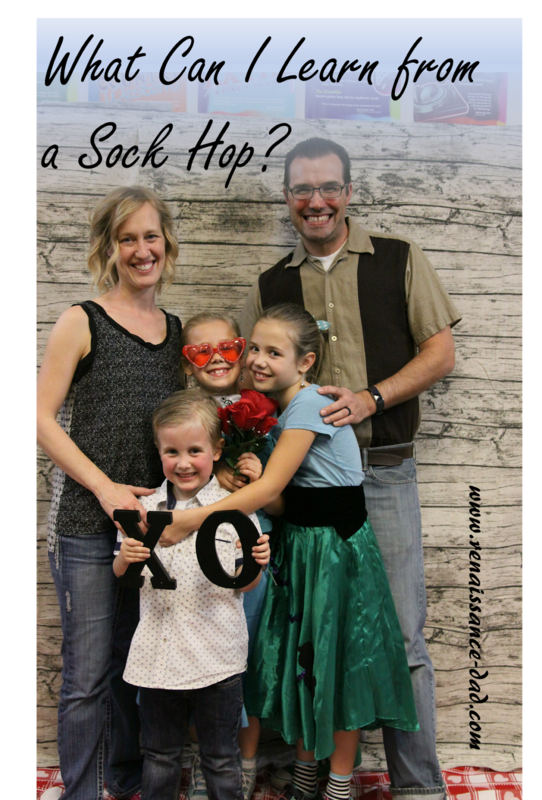 Sock Hops play classic rock and roll from the '50s/'60s, and kids usually come in poodle skirts, Chuck Taylors, and slicked back hair. My kids were excited. We all dressed up and got ready for a great time. As we walked to the school we listened to some classic swing music, dancing down the street and through the school parking lot. And then we entered the gym, with the lights turned off, strobe lights going off, and DJ Fresh playing some modern hip hop. I took a deep breath, and thought that maybe he was just getting it out of his system. But DJ Fresh continued to play music under the assumption that "oldies" were songs that topped the charts in 2016. My kids danced with their friends, but at the beginning of each song their shoulders slumped and they looked disappointed. After a couple of songs my wife went to talk to the booster club president to ask why they weren't playing oldies. She said that the kids won't dance to oldies and won't come to dances unless they play the top 40 charts. Then my oldest daughter went up to DJ Fresh to ask him if he would play A Wink and a Smile covered by Harry Connick Jr., which is not an oldie in the Sock Hop definition (side note, that song is the first song Big E and I danced to when I took her to her first prom at the age of two; it's "our song"). DJ Fresh had never heard of it but said he would try to find it and play it. He never did. After about 45 minutes, I could tell that my kids were putting on their brave faces and trying to have fun, but they were really disappointed that the dance was not going as advertised. Little E was having a blast in his wonderful, kindergarten, untrained break-dancing way, but the girls were looking for something difference. Then Big A asked me if we could go home and watch the Olympics since the dance was not what she was expecting. So we left, danced our way home, and watched the Olympics. "Kids won't dance unless we play the top 40 charts." Why, as grownups, do we often assume that we know what kids will and will not like? I've done it before. "I know you're not going to like this, but you need to eat it anyway." "I know you don't want to, but we need to go to the store." What if, and I'm just spitballing here, we stopped telling our kids that they're not going to like something just because we don't? Do we really think that a group of kindergartners through fifth graders would hate music that kindergartners through fifth graders 70 years ago loved? Do I really think that my kids will hate sauerkraut just because I did as a kid? (they don't, by the way). One of my last years as a classroom teacher, we held after-school swing dancing lessons leading up to our prom. The kids absolutely loved it. On the night of prom, the students did not want to dance to the top 40 pop chart, but would flood the floor when the DJ eventually played a swing song. Let's make an agreement to teach our kids to like a variety of things, like a whole bunch of Renaissance protégés . Let's teach them to have an appreciation for different experiences. By the way, if you don't have an "our song" with your kids, find one. After we got home from the dance, Big E came down in her pajamas while I was doing the dishes. She turned on A Wink and a Smile. I forgot all about the sock hop, and we danced. It was truly a special time together. DJ Fresh has nothing on that moment.